The Pebble Beach Classic Car Forum, an event that’s part of the Pebble Beach Concours d’Elegance, and takes place at The Inn at Spanish Bay—a hotel about 5 miles from the Pebble Beach lodge, over several days, has announced its schedule. We’re running it now in case any of our readers want to book a ticket. We are surprised at the array of speakers, including Kustom car creator Gene Winfield, and famed Pontiac engineer Herb Adams. Two comedian-collectors, Jay Leno and Jerry Seinfeld, will be speakers so there ought to be some good laughs along with the knowledge imparted. There are prices to attend the Pebble Beach Classic Car Forum sessions, (seems on average for a session to be about $35 though some are $75). 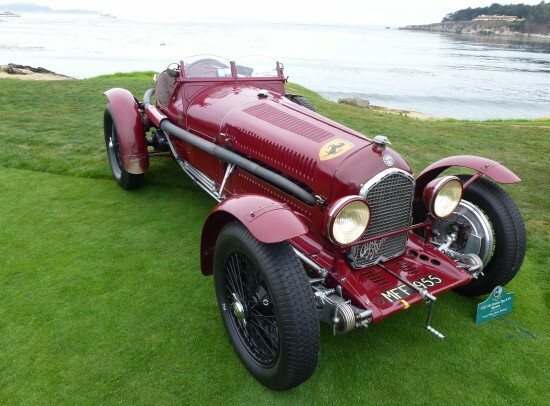 The best way to check the prices is go directly to the Pebble Beach Classic Car Forum schedule click here. As a doctor in Canada, James Colwill has focused on his collecting passion on and off since 1953. His collection now exceeds 750 mascots. His medical training led him to Colorado in the 1960s where he would spend extra time in junkyards, searching for rare and exceptional mascots. The 1970s took him back to Toronto, where the hobby became a serious pastime. He has published many books on the topic including the 4-volume set, The Automotive Mascot: Purpose Form and Function, the 3-volume set, The Automotive Mascot: a Design in Motion, and the 2-volume set, The Automotive Mascot Worldwide: An Objet d’Art. A book signing will immediately follow the presentation. The Automotive Mascot: 9 volumes available in the series by James Colwill. Ken Gross serves as a Chief Class Judge for the Pebble Beach Concours d’Elegance and is a member of the Selection Committee. An automotive writer for 44 years, Ken has received the Washington Auto Press Golden Quill Award, the Society of Automotive Historians’ Cugnot Award and the James Valentine Memorial Award for excellence in automotive historical research. Herb Adams was introduced to car design in high school through the Fisher Body Craftsman’s Guild contests sponsored by General Motors. After several attempts he won a scholarship and chose to study engineering. Later, as a Pontiac engineer, he made major contributions to the Trans Am model, the Judge package, the 303 race engine and the 455 SD engines. He has built over 70 experimental cars, the first of which was the 1965 Vivant, which will be shown at this year’s Pebble Beach Concours d’Elegance. He is lately focused on the Contessa Coupe and Roadsters that combine classic 1960s styling with modern and experimental technologies. Raffi Minasian is an award-winning writer, educator, automobile designer and a noted speaker at museums and corporate events on design, innovation, and creative processes. His prolific thirty-year design career includes aircraft interior design for Boeing, toys for Mattel and McDonald’s, and car designs for Toyota, Subaru, Moal Coachbuilders and The Franklin Mint. Through his specialty parts business, Raffi has manufactured thousands of unique parts for rare vintage cars. He currently writes a monthly design column for Vintage Roadcar journal. Frank Campanale’s passion is automobiles and automotive design. He is on the Board of Trustees of the College for Creative Studies, one of the top automotive and transportation design schools in the United States. Frank is a collector and restorer of prototypes and unusual cars. He has also been an accomplished racer in the SCCA, IMSA and HSR series and recently ran the Mille Miglia. Frank’s uncle was engineer and designer Paul Farago, who was very well known for his work with Virgil Exner on all of the Chrysler/Ghia concept cars. Spike Feresten, host of the hit car-buying show Car Matchmaker, is renowned as a writer/producer for TV shows such as Seinfeld and Late Show with David Letterman and as the star of FOX’s Talkshow with Spike Feresten. During his time on Seinfeld, he earned three Emmy nominations, including one for his well-known “Soup Nazi” episode. Spike’s two decades of automotive experience and expertise come from collecting his own cars to helping friends and family. His clientele roster ranges from well-known celebrities to his wife’s hairdresser. Now, Spike is the guy to go to when you need a new set of wheels. Entertainment icon Jerry Seinfeld’s comedy career took off after his first appearance as a stand-up comedian on The Tonight Show Starring Johnny Carson in 1981. Eight years later, he teamed up with fellow comedian Larry David to create what was to become the most successful comedy series in the history of television: Seinfeld. His latest project is the critically acclaimed Web series Comedians in Cars Getting Coffee, seen exclusively on comediansincarsgettingcoffee.com, and soon on Netflix. Jerry’s preferred bio: A comedian who lives in New York City. The 1953 Ferrari 340/375 MM, chassis 0320AM, set a record at the Carrera Panamerica at an average speed of 138 mph over 223 miles. It finished 6th that day. The record will not be broken because the Carrera Panamerica is no longer run, it was just too dangerous. Photo by Mike Gulett. For 18 years, Gerie Bledsoe has been a driver in La Carrera Panamericana, the Great Mexican Road Race. In 2002 Gerie finished First in Class and 8th overall in a 1964 Chevy II Nova. Gerie has closely studied the original Pan-Am (1950–1954), and has made numerous presentations on the event. As a child, Doug Mockett was captivated with 1950s Road & Track stories of the Carrera, and when it was revived in the late 1980s he had to sign up. He has driven his 650 hp 1954 Oldsmobile Super 88 in 27 Carreras, with finishes ranging from winning overall to ending up in the hospital after a crash. In 2016 he was 4th overall, losing 3rd by three seconds. Ivan Zaremba has been one of the principals as well as shop foreman/technician at Northern California’s Phil Reilly & Co., one of America’s most renowned vintage race car restoration and preparation shops. Among the cars in his collection is his 1951 Hudson Hornet, which he has owned since the mid-1990s and rebuilt in NASCAR form. It became the model for Doc Hudson of Pixar’s Cars. Ivan has been a Pebble Beach Concours Class Judge since 1985. John Lamm has been a respected automotive journalist and photographer covering the car world since 1975, first at Motor Trend, then Road & Track and now Car and Driver. His work has garnered numerous accolades, including the International Motor Press Association’s Ken Purdy Award and the Motor Press Guild’s Dean Batchelor Award. Derek Hill, the son of Phil Hill, grew up around the world of cars. After a 10-year career in professional motorsports, Derek chose to work with his father in the final years of Phil’s life to catalog his vast archive of photos, documents and memorabilia. Derek is an accomplished vintage racer and precision driver for TV commercials. He has been a Class Judge for the Pebble Beach Concours and is now its Master of Ceremonies. Steve Dawson is a Los Angeles–based photographer whose passion is motorsports and was a friend of Phil Hill’s for 30 years. He organized and archived Phil’s Kodachrome slides taken during Hill’s long racing career. Together they exhibited Hill’s color photographs in displays at the Monterey Historic Races. Steve spent four years recording Phil’s memories and recollections to caption his photographs. In collaboration with Doug Nye and Derek Hill, those memories are the basis for the forthcoming book Inside Track. Derek Hill has worked with Doug Nye and Steve Dawson to produce Inside Track, the book that documents Phil Hill’s life of photography and stories of his years in motor racing. Alain de Cadenet spent his early career racing cars and motorcycles at races such as the 24 Hours of Le Mans. He has raced at all of the great circuits, including the Targa Florio, Nürburgring, Spa, Monza and Monaco. Alain was his own Formula 1 team boss and managed the late, great Graham Hill prior to his retirement. He was the first man to design, build and drive his own car to victory in the World Championship Sports car race. His television work began in 1976 as a BBC London TV pit reporter for Grand Prix racing. During a career that spanned four decades, Belgian driver Jacky Ickx ruled sports car racing throughout the 1970s and 80s. In Formula 1 he achieved 25 podium finishes in the 1970s and was twice runner-up in the World Championship. His other titles include six-time Le Mans winner, five-time Spa 1000 km winner, and he is a multiple sports car World Endurance Champion, European Formula 2 Champion and, impressively, the Paris-Dakar Rally victor in 1983. Chris Erblich is a member of Husch Blackwell’s Financial Services industry team and concentrates his practice on sophisticated estate planning, business succession planning and tax planning for high net worth clients and business owners. He has clients in more than 20 states, a number of whom are on the Forbes 400 list and include current and former professional athletes, professional sports team owners, entertainers and owners of large closely held businesses. Jay Leno, right, will be a speaker, Wallace Wyss on the left will not. The machine that changed the world at the beginning of the 20th Century — the automobile — seems poised to change it yet again. Cars are in the midst of four simultaneous revolutions: propulsion, connectivity, community (ride-sharing) and autonomy. The latter, the driverless car, would be the biggest revolution of all. The fate of automotive enthusiasm and classic cars in this new world will be addressed by a panel of experts by brought together by The Revs Institute and founder Miles Collier, known for pioneering work in the evolving thought around automobile collecting, preservation and education. The Revs Institute, founded by Miles and Parker Collier, operates a museum and research center in Naples, Florida, and the Revs Digital Library of automotive history. The Revs Institute is dedicated to the proposition that the automobile is one of the most important legacy artifacts of the 20th century, worthy of study, deep understanding and appreciation, including the social/cultural contexts in which the automobiles were developed. Paul J. Ingrassia is editor at The Revs Institute, an automotive history and research center in Naples, Florida. Previously managing editor of Reuters and before that Detroit bureau chief for The Wall Street Journal, he is a Pulitzer Prize–winning journalist and author who has written extensively about the auto industry for more than 30 years. His most recent book is Engines of Change: A History of the American Dream in Fifteen Cars. Miles C. Collier is a noted authority on vintage automobiles. He is the founder of the Revs Institute for Automotive Research Inc., which houses the Briggs Cunningham Collection purchased by Mr. Collier in 1985. He is also the founding supporter of the Revs Program at Stanford University. Simon Kidston is a classic car commentator, columnist, consultant and producer of short films on the greatest classic cars. Kidston SA has been responsible for the sale of some of the world’s highest-value motorcars. Simon devised and launched K500, an online resource that gives honest opinions and unbiased insight into the market. As Ford’s Global Design Director, Chris Svensson oversees the design DNA development of all new SUVs, trucks and commercial vehicles globally. His career with Ford began as a designer in Ford of Germany’s Design Studio. Since then Chris has held a number of key positions in North America, Asia Pacific and European regions. Chris Urmson is a co-founder and CEO of Aurora Innovation Inc., a company focused on making self-driving cars a reality. Chris previously led Google’s self-driving car program and was a member of the faculty of the Robotics Institute. Chris earned his PhD in 2005 from Carnegie Mellon and his BS in computer engineering from the University of Manitoba in 1998. The name Ed Iskenderian is a legend among racers worldwide. He created the first hard-face overlay camshafts in the industry and was the first to employ computers in camshaft design. He also entered into the first corporate sponsorship of a race operation. In 1985 Ed was inducted as a member of Chevrolet’s Legends of Performance. In the same year, he was inducted into the SEMA Hall of Fame. His company, Isky Cams, is the world’s largest racing, performance and economy cam manufacturer. Ralph Marano is one of the premier living Packard collectors in the world; his collection numbers 85 classic automobiles. In 1982 he started Marano & Sons Auto Sales in Garwood, New Jersey. Today the business has 150 cars in stock and his sons, Ralph Jr. and Jimmy, work with him. Steve Moal’s grandfather William emigrated from France just after the turn of the century and began outfitting horse-drawn wagons. In the 1920s he began applying his skills to race cars and showcase speedsters. In the 1940s George Moal, Steve’s father, founded a body and fender business. Steve carried the tradition forward with a totally new approach to the creation of custom coachbuilt vehicles for discerning motoring enthusiasts. Don Orosco has enjoyed an historic racing career spanning more than 40 years in races across the United States, Europe, and Japan, including Laguna Seca, Monaco, Spa, the Nürburgring, Silverstone and the Goodwood Revival. Largely associated with racing the Reventlow Scarabs, Don also campaigned Porsche Spyders, a Birdcage Maserati, a Lotus 15, 16, 18, 19, 23 and 26R, and more than 80 of the most famous race cars ever built. He maintained an award-winning in-house restoration staff for 16 years. Don has extended his love of motorsports to historic go-karts, which he enjoys restoring and racing with his wife Kelley. Matt Stone is an automotive freelance journalist, author, broadcaster, automotive event emcee, book author, and former editor of Motor Trend Classic magazine. He has been a professional automotive journalist/photographer since 1990 and has authored and photographed more than a dozen automotive book titles, with more in process. He is a past officer and Board of Directors member, and past president of the Motor Press Guild trade association. We are surprised at the array of speakers at the Pebble Beach Classic Car Forum, including Kustom car creator Gene Winfield, and famed Pontiac engineer Herb Adams. Two comedian-collectors, Jay Leno and Jerry Seinfeld, will be speakers too! It’s an honor to be listed with the esteemed group of people in this event.